Apples or Apple®: Are Teacher Gifts Going High-Tech? A survey of 639 teachers conducted in April 2014 by Really Good Stuff shows new trends in the gifts teachers receive. A recent national survey of 639 school teachers in the United States, conducted by Really Good Stuff, Inc., a company that provides classroom teaching tools and elementary curriculum to K-6 school teachers, reveals that 94 percent of teachers still receive gifts from students, but the frequency and monetary value of the gifts is changing. According to the teachers surveyed, 81% of them reported that there are no restrictions on gift giving or receiving in their school district. 92% of the teachers indicated that the Christmas/Hanukkah season is the most popular time of the school year for teachers to receive gifts. Coming in second was the end of the school year with more than 74% of teachers reporting that they receive gifts before summer break. 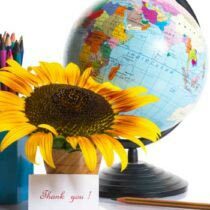 Teacher Appreciation Week, typically the first full week of May, also ranked as one of the most popular gift giving holidays with over 51% of the respondents reporting that they received gifts during that time. While the majority of teacher respondents reported that gifts are still be received throughout the school year, they reported changes in the types of gifts. 3) The overall value of gifts have decreased. Whereas gifts for teachers used to be more personal, more than 47% of all responses now report that gift cards are the most popular gifts received during the last two years. Handmade gifts, however, continue to dominate the gift field with over 58% of teachers indicating that they have received a handmade gift within the same time frame. Surprisingly, despite teachers’ reported perception of a decrease in gift value, 10% of those surveyed said that they have been gifted with an Apple® (AAPL) product by students and parents. While this statistic has a way to go before reaching the popularity of receiving an apple (the fruit) as a gift (over 74% reported receiving one), it is another indication that times and technology are changing. When asked to describe the perfect gift, more than 27% of the teachers reported that something for their classroom would be ideal. 46% said that a gift card would be preferable, but most telling was that the third most cherished gift by teachers was a note or card of thanks. In fact, when asked which non-monetary gift they would most prefer, almost 42% of them said that a handmade card or note of thanks would be their choice. In line with their ideal gift preferences, 27% of those surveyed said that used children’s books for the classroom library would be a great non-monetary gift. Despite a shift in the types and frequency of gifts that teachers are receiving, there is clearly an appreciation for each gift received. With handmade cards and notes of thanks topping the ideal non-monetary gift list, it is evident that a kind word of appreciation goes a long way in making a difference. Although an Apple iTunes® gift card, iPod®, or iPad® would certainly brighten any teacher’s day. Really Good Stuff®, Inc. has been dedicated to helping teachers throughout the USA and Canada change the world, one child at a time since 1992. The company is located in Monroe, Connecticut. For more information about Really Good Stuff, Inc., please visit: https://www.reallygoodstuff.com/. The survey conducted by Really Good Stuff, Inc. sampled 639 PreK-12 teachers.